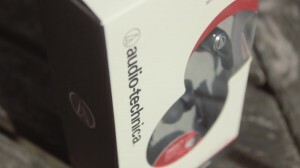 Audio Technica is well known for their audio products, in the past they have impressed by delivering performance in their headphones that is usually found on products double the price. AT are going for a different approach this time, these are for the people who enjoy fitness. You can get these for £60 off Audio Technica’s website and they’re advertised to deliver clear and natural audio while being comfortable and robust. 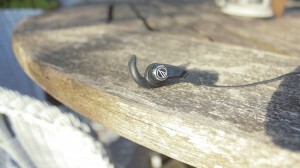 They also have some interesting features such as a unique C tip which is supposed to help the earphones stay in your ears. More on that later. In the box you get the earphones themselves, a load of eartips and a nice little carrying pouch which is made out a velvety material. It’s nice to see Audio Technica include these sort of accessories. My first impression the earbuds were they didn’t really seem to be very well made as all the parts are made out of a glossy plastic and that the c tip eartips didn’t work well and made it fiddly putting the earphones into your ears. 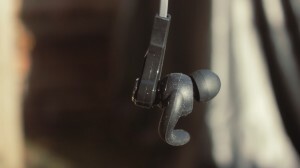 Taking a look around the earbuds, we can see that at the top there are the eartips along with the c eartips which I’ve already said aren’t very good. Thankfully they can be removed. Next to that there is some Audio Technica branding and further down we have the flat cable that’s designed to last longer and decrease tangling. The cable does feel very well made and seems to be quite durable. 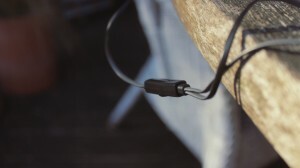 Along the cable, there is volume controller which doubles up as a microphone and a call control button. Like the earphones themselves, they’re made out of a glossy plastic. I don’t really understand why Audio Technica did the earphones in this style, and in my opinion they would have looked and felt better if they were done in a matte plastic. Finally, at the bottom of the cable, you’ll find a 90 degree angled headphone jack. Now onto the audio quality. I left these to burn in with a mix of Drum and Bass and Alternative music, paired with my Asus DGX 5.1 soundcard. One of the first things I noticed was that the vocals sounded very crisp and the audio sounded overall natural like it’s advertised. To my disappointment, the headphones lacked bass. How big of a problem this is for you really depends on what sort of music you like listening to. For me, I found this to make a lot of the music I listen sound flat and slightly tinny at times. These aren’t a gaming set of headphones by any stretch of the imagination, but I found as they lacked bass you were able to hear footsteps much clearer than you would on a pair of headphones with better bass as the booming sound of gunfire wasn’t there to distract you. My final opinion of these is that I think these headphones are okay but are nothing amazing. Yes they do have some cool features like the rotating ear tips and the flat cable, but at this price, you it’s a bit saitisfactory. I think Audio Technica spent too much time focusing on gimmicks like the c tips when they should have focused on what really matters, audio quality. These aren’t for everybody, but if you’re into your fitness and you’re not a basshead, then these are a solid choice. Anyway, we’d like to know what kind of audio setup you’re using. Leave your comment down below.